B-29s of 881st Squadron, 500th Bomb Group, 73rd Bomb Wing, 20th Air Force. The 500th was commanded by Brigadier General John Eugene Dougherty. Closest to the camera is the B-29 named "Sna pe fort" (B-29-15-BA Z Square 19, serial number 42-63435, built by Bell in Atlanta, Georgia) flown by First Lieutenant Robert E. Altoff. She was Z Square 3 originally. The original crew named her "Snafuperfort" because of mechanical unreliability and later switched planes with Altoff's crew. Altoff flew 35 missions without incident. Behind "Sna pe fort" is "Fire Bug" (B-29-70-BW Z Square 15, serial number 44-69944, built by Boeing in Wichita, Kansas) flown by First Lieutenant Claude E. Bower. Fire Bug completed 30 missions, three with Bower in command. Following Fire Bug is an unnamed Superfortress (B-29-30-MO Z Square 14, serial number 42-65346, built by Martin in Omaha, Nebraska) flown by First Lieutenant Walter S. Mather. 42-65346 flew 38 missions before it was written off or destroyed. The 73rd's Mission Summary read: Mission # 186. Date: 29 May 1945. Target: Yokohama Area. Participating Units: 58th BW, 73rd BW, 313th BW, 314th BW. Number of A/C (aircraft) Airborne: 510. % A/C Bombing Primary: 90.8% 454 Primary and 21 Opportunity. Time Over Primary: 291014K - 291129K. Altitude of Attack: 17,500 - 21,000. Weather Over Target: 9/10 high clouds. Total A/C Lost: 7. Resume of Mission: Available photos indicated excellent bombing results. A total of 6.9 square miles of the city were burned and destroyed. 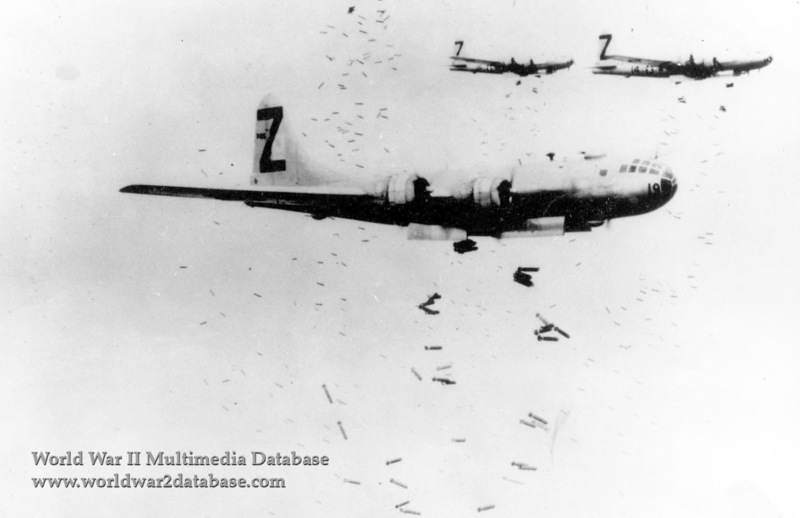 A total of 2, 569.6 tons of bombs were dropped on the primary target and 105.6 tons on targets of opportunity. Thirty-five A/C were non-effective. Fighter opposition consisted of 55 A/C sighted making 110 attacks. Claims were 6 confirmed, 5 probable, 10 destroyed on the ground. Flak was heavy, meager to intense, accurate to inaccurate and shot down 3 B-29s. The B-29s were escorted by 101 P-51s. Two P-51s were lost over the target. One B-29 was intentionally rammed. Two A/C ditched. Thirty-nine A/C landed at Iwo Jima. Average bomb load: 12,040 lbs. Average fuel reserve: 811 gallons. This photo was used on Japanese language propaganda leaflets warning of impending attack. It was a crime to possess the flyers, which were suppressed by the government.